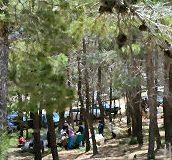 The picnic area is situated in the woods with an idyllic feel. There is capacity for upto 250 people and each table with its own BBQ. 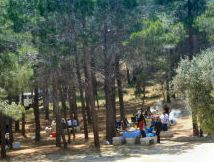 All you have to do is bring your own food and drink to have a wonderful picnic or BBQ. We sell charcoal or you can bring your own. You can play music (as long as you don't annoy your neighbours), play ball games in areas provided, enjoy the kiddies swings, use the facilities, all for a small fee per table.